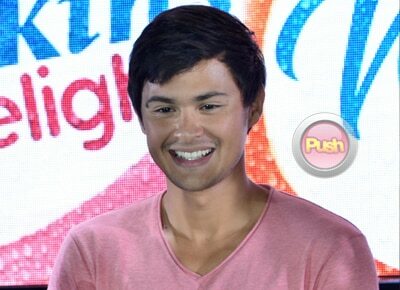 Matteo Guidicelli talks about his fascination with the popular young love team. As part of the upcoming Star Cinema film Can’t Help Falling in Love, Matteo Guidicelli admitted he is excited for the people to see him in his role as Kathryn Bernardo’s fiance. “This is going to be different because first I’m going to be with Kathniel. I know they’ve been a love team for a long, long time but working with them was very, very refreshing. You guys should watch because my role is very different also,” he shared during the Wilkins Delight #AddColorToYourLife event held last April 5 in Makati city. The 27-year-old actor admitted his impression of his co-stars was better than what he thought it would be. “Very inspiring kahit young love lang sila you know. Kathryn is a wonderful person. She’s extremely nice. DJ is such a nice person also. I was very shocked, impressed actually on how nice he was. I’ve never really worked with him but I said hi, you know acquaintance lang. And you think he’s a really astig guy. He walks up with his head high. He’s a very, very humble person and Kath also. It was a delightful experience working with Kath,” he explained. While filming the movie, Matteo said he witnessed firsthand just how sweet Daniel Padilla and Kathryn Bernardo are even when the cameras weren’t rolling. “When I see them, they are so PDA that you would go, ‘Wow, they love each other so much.’ They’re like magnets to each other, alam niyo yun? But it makes you smile eh. It makes you happy. It makes your heart pump more blood and make you happy di ba? Everybody has their own style of showing affection and everything and I guess that’s their style but working with them it was a refreshing feeling to see two people love each other so much so it was very nice to see. For me it was very refreshing and heartwarming to see,” he shared. After being part of Can’t Help Falling in Love, Matteo admitted he can’t help but become a big fan of Kathniel. “Yes it’s true (laughs). We had a presscon a few days ago and I said watching them as a big phenomenal love team and working with them and seeing them together and speaking to them, they’re very, very nice people and I respect them for that because with all the fame and everything they’re just very cool, chill people,” he said.